We are teaming up with Graveside Paranormal on Saturday, May 19th! 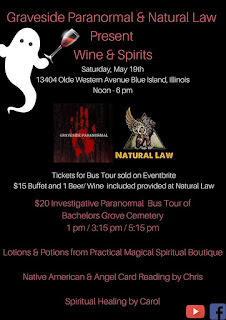 Three time slots (1/3:15/5:15PM) are available for bus tours to Bachelors Grove Cemetery from Natural Law. Space is limited. Follow the link below to get your ticket for $20. Under 21s are welcome to participate in the bus trip portion of this event if accompanied by a parent/guardian. No one under 21 is allowed inside the bar. We will be debuting a new wine to accompany the "spirits". Spiritual healers and card readers will be on site. Their services and food/beverage purchases are priced separately.